Democratic hopeful Katie McGinty and GOP incumbent Sen. Pat Toomey. Given the various shortcomings of the two presidential candidates' economic policies, the race to represent Pennsylvania in the U.S. Senate takes on particular importance. Without more sober direction in terms of fiscal policy from the next White House, the Senate's job as a moderating influence to whichever presidential candidate emerges victorious will be essential to addressing our growing fiscal imbalances and fostering long-term economic growth. The philosophies of our Senate candidates are clearly differentiated in this regard. 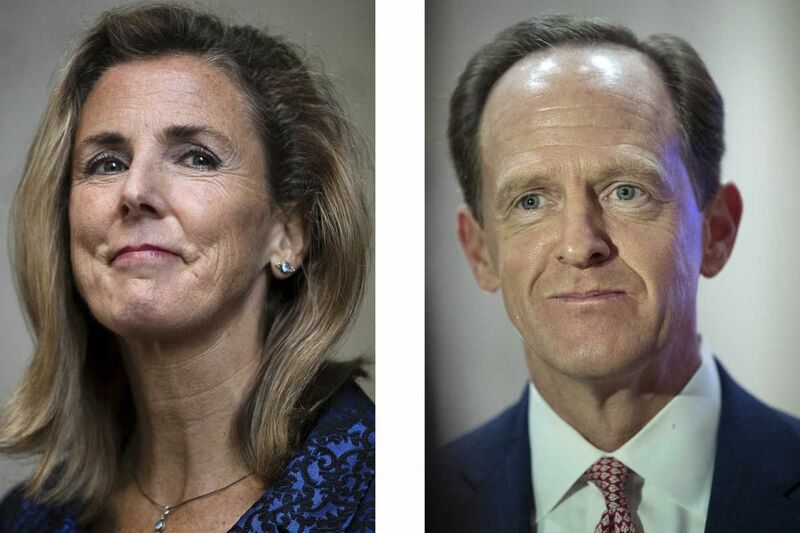 Katie McGinty espouses a philosophy of supporting the economy through increased government assistance funded by higher taxes, while Sen. Pat Toomey takes a more conservative view of things focused on fiscal sustainability and less government intervention in the economy. On taxes, the two candidates appear to agree on only one thing: the need for reform. This is an important first step, but in tax policy, as in life, the devil is always in the details. An efficient tax system must be graded across four criteria: simplicity, transparency, equity, and sustainability. Simple, so that it takes as few resources as possible to comply with and enforce. Transparent, so that people and businesses can make long-term economic decisions with certainty. Equitable, so that all parts of the economy are growing strong. Sustainable, so as to provide ample resources to fund the government without running up the national debt and ultimately crowding out the private sector. Simplicity and transparency typically go hand in hand, and Toomey has gone out of his way to point out his commitment to balanced tax reform by eliminating special tax treatments and loopholes in an effort to lower rates across the board. A broader base with lower rates is the very essence of a simple and transparent tax code. However, it will be extremely difficult, if not impossible, to achieve in the current political environment. McGinty's record is a bit more difficult to read in this regard, as she has never held elected office and has provided very little detail as to any future fiscal plans thus far in her campaign. However, she has worked for other government officials in various capacities throughout her career, and we can glean from her experience and public statements in this regard more or less where she stands. McGinty has supported a wide variety of tax increases, both during her time as Gov. Wolf's chief of staff and with regard to current proposals offered in the Senate. While these proposals would generally raise net revenue, it would be difficult to say that they would have necessarily made the tax code considerably more complicated, outside of some measures related to what was undoubtedly a very complicated property-tax proposal put forward during Wolf's first year in office. An important caveat to this is that McGinty also voices strong support for Hillary Clinton's tax plans, which would add an incredible amount of complexity to the U.S. tax code as well as additional debt to our balance sheets. Toomey, by contrast, has not endorsed Donald Trump's fiscal plans and actually denounced specific policies that would add to the deficit and national debt. Equity is equally important, and an area where it is even harder to differentiate between the two candidates' records, which are mixed. All tax codes should be at least somewhat progressive to be termed equitable. McGinty has supported Clinton's proposals, which are extremely progressive in their impact on high-wage earners. However, other plans she has supported in the past, like Wolf's proposal to expand sales taxes to offset cuts to property and corporate income taxes, would have actually been regressive. At the time, Pennsylvania's official nonpartisan Independent Fiscal Office projected the legislation would raise tax burdens across the income spectrum, not just the wealthy. Toomey has voted for across-the-board tax cuts in the Senate but also did vote to raise federal personal income taxes on individuals earning more than $400,000 per year in a bipartisan compromise with President Obama to keep lower rates in place for low- and middle-income taxpayers. This leads us to sustainability, an area where the Republican presidential candidate has scored poorly, but one where Toomey individually stands out. In addition to his vote to raise taxes on the wealthy to preserve lower rates for low- and middle-income Americans, Toomey has publicly committed to a balanced-budget amendment to the Constitution. This is laudable in principle but difficult to do correctly. It would have to be implemented over a very long period of time and have special allowances and exceptions for emergencies such as recessions or national security concerns. This approach also helps put his tax proposals in a more flattering light, as any reforms to broaden the tax base and lower rates, in contrast to Trump's proposals, would have to occur in a revenue-neutral manner. Alarmingly, McGinty has been much more ambivalent about the deficit and national debt. In fact, her campaign website actually makes no mention of either concept whatsoever. What's more, several current proposals that she supports have been scored by independent sources as increasing the debt and deficit. For example, the expanded Family Leave Act. While an extremely important cause, the plan has been scored by independent groups as costing materially more than would be raised by enacting the bill's corresponding new payroll tax. The resulting cost overrun would increase the deficit in turn. This is not an area where we can afford ambivalence. The Congressional Budget Office projects that by the end of the next Senate term, roughly 95 cents from every federal tax dollar will be earmarked for entitlements or interest. Regardless of which party takes the White House, the next several years will be filled with some heavyweight budget battles. During that process, Toomey's position on the Budget Committee will be a big advantage for our commonwealth. Looking objectively at McGinty's background and experience, it is unlikely that if elected she would be assigned to either the Budget or Finance Committees, which will decide those important matters in the years to come. From the standpoint of fiscal policy, the presidential election is a frustrating choice between the lesser of two evils, but the Senate election offers us a reprieve. Pat Toomey is best positioned to play the adult in the room on fiscal policy.